I was always surprised to see the wide price differences between HP vintage oscilloscopes and HP spectrum analyzers from the same period. So it was with excitement that I got a HP 8591E spectrum analyzer for our shop. A swept-tuned analyzer uses a superheterodyne receiver to down-convert a portion of the input signal spectrum to the center frequency of a narrow band-pass filter, whose instantaneous output power is recorded or displayed as a function of time. By sweeping the receiver's center-frequency (using a voltage-controlled oscillator) through a range of frequencies, the output is also a function of frequency. But while the sweep centers on any particular frequency, it may be missing short-duration events at other frequencies. In future installments I will discuss this wonderful machine - complementary but completely different to your oscilloscope. During this week end I have been beginning to repair our unit of HP54501a oscilloscope from the early nineties. What a design! The main circuit and all the other circuits (keyboard, power supply, CRT driving circuits) are of exceptional design. The main circuit is built around a Motorola 68000 microprocessor, and the layout and the PCB itself are incredibly beautiful and well done. This is the quality of HP of that era, second to none. Also the clarity of the manuals and the accompanying documents is exceptional. You get a course on oscilloscope basics for free when you read them! I will post updates as the repair go. Suffice to say that the self test information was extremely clear and conducive to an easy diagnostic. There are always those that would like to have the full Monty (never better said when referring to Monte’s development), and then you may want to have the time module too. Or, you have interfaced your hp41c with other items, and then you need to launch programs at a determined time intervals. I once did that, when I connected a HP3468A HP-IL multimeter to the HP41CL to check what was the voltage in my weekend cabin during an extended period of a week. Then it was grabbing data every half hour for the whole Monday to Friday we’re not there. - use it in conjunction with astronomical programs, to better direct your telescope. - Use it during flight to calculate fuel consumption rates, direction drift on side winds during time periods, etc. As always, here is no reason this couldn't be done with a smartphone - but if you don't have the program that does what you want, then the easily programmable HP 41CL can come to the rescue nicely. New connectivity and virtual Prime calculator software! New Prime software issued in December. You remember probably that we announced a beta version of new connectivity software, and also virtual calculators, with the advantage of introducing Mac OS versions of both. So, for those of you that were using Windows virtual machines to be able to make it work, you need to run to the ftp site and retrieve the new versions to have MAC OS native Prime apps. And they do work well! The connectivity kit and emulator are now supported on both windows and mac. The iOS/Android/Winstore versions will be downloaded through your normal phone update mechanism as they are approved by the various stores. This release is focused around getting macOS support, and all the store applications synchronized. There were some changes in the Core calculator code, but mostly this will be identical to the last release. A HP 8591E Spectrum Analyzer. This is a very interesting machine, which many amateurs don’t have due to its high price. We’ll try to make a special price since we got a decent deal ourselves. 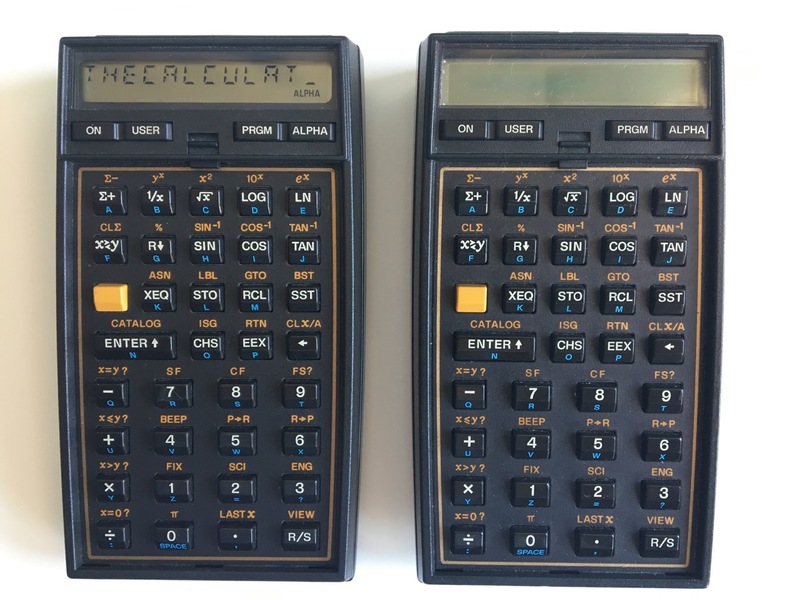 Also, there are many other items coming our way - including boxed, near mint calculators - stay tuned! We now have again two HP41CV units left, with all back ports and battery side cover. It is still a wonderful machine, that can be enhanced with peripheral and modules to a still competitive machine - not in speed but in functionality. And with the legendary HP keyboard click! One unit is a full nut and the other is a half-nut: the newer design which is more reliable since it has fewer inner parts. Price is 130 € plus shipment. We have received several calculators in good physical state that we have thoroughly revised and -when needed- repair. Two HP41cv machines. One of them is a full nut; the other is a half nut. Both are in very nice shape, with all back and side ports available. Repair assemblies: nicely collated flex circuits onto original plastic inserts for battery-port contacts. We also have memory modules, extended memory modules, math and stat modules (boxed! ), a rare Home Management module, the powerful Advantage module, and many more goodies. We also have a HP3478A multimeter that works well and still keeps the battery strong. We’re also preparing a HP 54201A Oscilloscope, for which the data battery died and we’re soldering a new one, good for 30 year more, and a HP 8591E Spectrum Analyzer, for which we’re doing a thorough testing - so far it seems to be working well. It is an amazing machine, that you can interface through HP-IB to your (old) computers. Please drop a line to sales@thecalculatorstore.com to get more information about our measurement items. I have been spending some time in trying to learn 3D printing creating software, in order to create calculator pieces. In Shapeways, there are already several parts for the HP41c and other HP calculators. Look for designer davef, who has designed several parts for our calculator: back port doors, side battery doors, battery covers and other HP71b items. However, these never have exactly the look and feel of the real thing - they could even be considered nicer, but not the real thing. But there is no need for nice finish for internal parts! So I am looking forward to create a piece that can be used in the innards of the calculators. You need to destroy - or abandon repair - a calculator to repair another, and that’s a quite expensive way of doing it! The price in Europe for defective HP41c is around 75-85 EUR. So any effort to create parts that help keeping in shape our best tools is welcomed - but it sure takes time for someone not used to it! 3MTM Electrically Conductive Aluminum Tape 3302 is a 2.0 mil (50 micron) high strength dead soft aluminum foil coated with specially formulated conductive pressure sensitive acrylic adhesive system. Good adhesion, malleability and adhesive conductivity allow for extremely low resistance and make this an excellent shielding tape. Designed to meet a wide variety of EMI and RFI shielding applications in the electronics industry. Also for use in printed circuit manufacture and repair. Cut in small pieces, it can be used to cover the eroded parts of the battery contacts. Please remember to remove all oxide with Caig De-Oxit first; in some cases, the conductive film of the circuit will be destroyed in the contacting part, and there comes handy the conductive aluminium tape. You need to cover the whole contact, to maximize the electrical transfer area. Nacho thinks that it also needs to look good: a proper repairer will cover all four contacts, so that it looks coherent and symmetrical. It also can be used in other circuits to create aground plane, and also for shielding. Every repairer should have this in his toolbox.